There are countless memories from every Ironman. Some are unique to the particular race – like the magic of racing over the George Washington Bridge – and some – like that incredible sensation of finally crossing the finish line – that are universal. But for me, there is nothing more special than the chance to speak to all of my fellow athletes. To have this opportunity because of winning an Ironman just a few miles down the river from where I grew up? It almost doesn’t seem real. We all stood on the shoulders of a giant army of volunteers and spectators yesterday. And we stood on the shoulders of the giants in our lives just to get there. My wife, who – in addition to being the mother of a thirteen month old (which is why she’s not here today) – also has to deal with a spouse whose job it is to totally exhaust himself most days, is my giant. So are my parents, who – after watching me play numerous lacrosse matches in high school in Riverside Park – got to see me finish an Ironman there yesterday. We all race Ironman on our own. We all had to get ourselves from that barge in the Hudson to that finish line in the park using nothing but our own bodies, and – on a day as hard as yesterday and a course as relentlessly difficult as this one – we needed a lot willpower too. When I first saw the fast swim time, I thought, “maybe I’ll break 8 hours.” Then, on that second trip back into that headwind on the bike, I revised my goal to, “maybe I’ll just try and set a best time.” And, then, after making the trip to the first turnaround at about 3.75 miles into Palisades Park, I revised my goal again to, “maybe I’ll just worry about actually finishing.” I don’t think ice has ever been so magical and holy. But even though we are responsible for getting ourselves from start to finish by swimming, biking, running (and WALKING some stairs), we do not race Ironman alone. And THAT is what makes Ironman truly special. We are given the chance by others to see what we ourselves are capable of; sometimes it ends with a finisher’s medal and sometimes, unfortunately, it does not. But however it ends, it always begins the same way – with a single athlete – surrounded by 2500 of their closest totally insane friends – getting ready to do something remarkable by standing on the shoulders of giants. I hope no one takes this as diminishing their own achievement in any way. It does not. It enhances what we all achieved. Because what we achieved we achieved together. My day was possible because of you. And I hope that – in some small way – I might have helped to make your day possible a little bit as well. But all of our days were possible because of someone else. The aid station volunteer who ran that extra step to get us another cup of coke. Or the understanding spouse who accepted, more than just once or twice, that we needed – really needed – to disappear on our bikes for the entire day in training. How do we thank them? In some ways, we can never really thank them appropriately. But in many other ways, I think we already have. We’ve thanked them by being brave enough to risk standing on that start line. And we’ve thanked them by pushing our bodies and our minds and our limits. We’ve thanked them by doing something amazing. We’ve thanked them by giving everything just to hear four simple words. YOU. ARE. AN. IRONMAN. We all need to be proud of what we’ve done. And we need to be proud to have had so much help along the way. Because the memories we have may be our own. But it’s the memories we share that I think make us human. And I don’t think I’ve ever felt anything that makes me more human than doing an Ironman. It makes me feel alive. And it makes me feel – more than anything else I’ve found – like I’m part of something larger. Because I shared what I’m lucky enough to do for a living with all of you. And you are kind enough to share what you do with me. And we all share it with the people in our lives that our most special to us. We share it with the giants who are kind enough to let us stand on their shoulders, so that we might see farther than we could on our own. Far enough, perhaps, to see the limits of what is truly possible. I look forward to every one of your posts, particularly your speeches. Thank you for so eloquently expressing these thoughts and congratulations on a well deserved win! Thanks so much for that post, it was very true and inspiational. 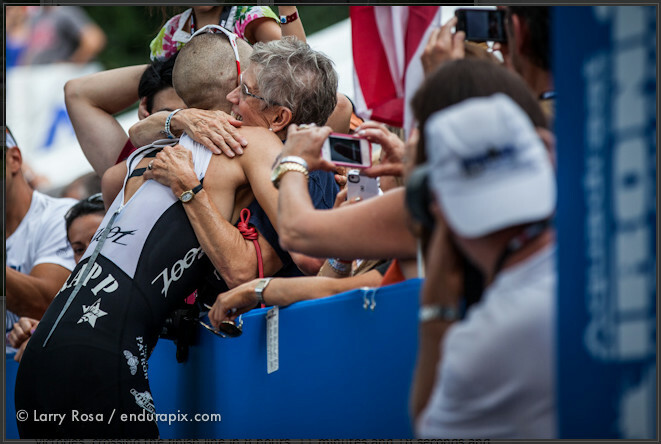 You are a class act and great spokes person for the sport of Triathlon. Congrats on you win well deserved…..many more to come!